Unreimbursed hospital costs result when hospitals provide needed care to under- or uninsured patients who are unable to pay for the services received. Central Health works closely with Travis County’s largest hospital networks—Seton Healthcare Family and St. David’s HealthCare—to ensure all residents receive access to the hospital care they need. UC subsidizes costs incurred by Seton and St. David’s hospitals for unreimbursed services provided to Medicaid and uninsured patients. DSH provides payments to qualifying hospitals that serve the largest numbers of Medicaid and uninsured patients. 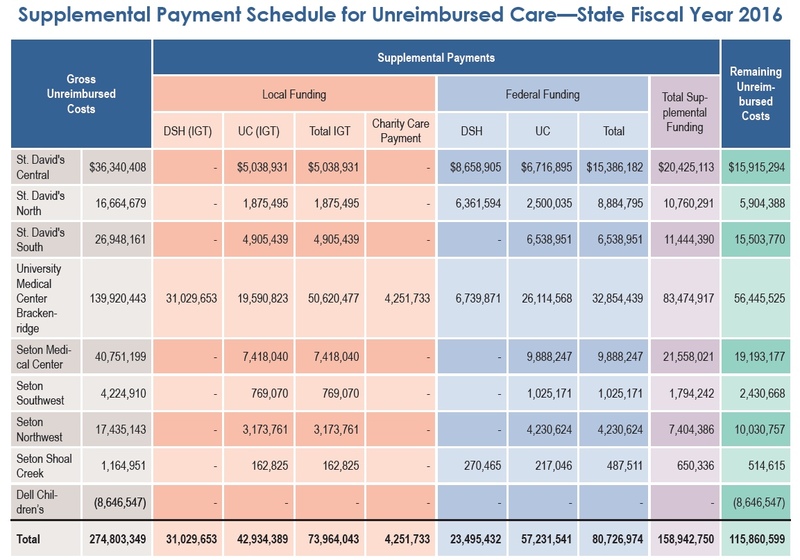 This table shows in state fiscal year 2016, Travis County’s two major hospital systems provided approximately $275 million of gross unreimbursed care. Even with intergovernmental transfers and supplemental funding of nearly $159 million, there remained approximately $116 million in unreimbursed costs. Central Health projects $109 million in supplemental funding will be available to offset unreimbursed hospital costs from state fiscal year 2017.